A recent survey has revealed the impact of government changes on provision of occupational health services. Nic Paton reports. If you want evidence of the two-track Britain that exists when it comes to occupational health provision, you do not need to look much further than this year’s EEF/Westfield Health “Sickness absence and rehabilitation survey”, published in May 2012. Nearly 430 manufacturing firms took part in the poll. The majority (79%) were small and medium-sized enterprises (SMEs) employing up to 250 staff. The poll found that OH services are provided in all of the biggest firms surveyed. Generally, OH provision had increased among firms of all sizes. The proportion of businesses indicating that they have OH provision rose, year-on-year, from 65% to a healthy 75%. Demand for external OH provision appears to have been rising, with just under six companies in 10 (59%) reporting that they now use external OH services, compared with fewer than half in 2006. However, to assume that the argument for occupational health has been all but won would be wrong. 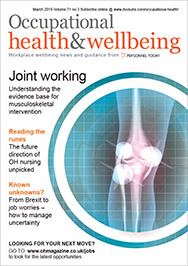 The research concluded that a quarter of all businesses still do not provide an occupational health service and these were made up almost exclusively of firms employing fewer than 100 workers. By comparison, almost all firms with more than 100 employees provided an OH service of some description. For Terry Woolmer, EEF head of health and safety policy, this illustrates that progress has been made, but also that the Government still needs to show commitment and leadership to workplace health intervention. “There has been a continuing increase in demand for OH services, especially for external services. So that is a positive message for the OH community,” he concedes. But the continuing disparity between big and small indicates how the Government needs to commit itself to the recommendations made by Dame Carol Black and David Frost in their review of sickness absence published in November 2011, Woolmer argues. He says: “I think we need a positive response from the Government to that review, especially to the idea of an independent assessment service [IAS] and the issue of tax relief. “With the IAS, when someone reaches that four-week period [of sickness absence] an employer can get them in to it. That is certainly much better than having them drift off on to long-term sickness absence. The research has revealed some intriguing findings (see box), including: that absence rates appear to have plateaued, perhaps because of the effects of the downturn; that presenteeism appears to be a growing problem (perhaps for much the same reason); and that, while use of the fit note is beginning to bed down, it is still not loved or respected as a tool for managing absence or sickness more effectively. Broadly speaking, employers were supportive of the new fit note regime, yet the majority felt that, in reality, it had not changed things that much. “What this shows, I think, is that it does take some time to deliver the cultural change that is needed to go from the sick note to the fit note. The Government needs to be more proactive in helping to bring through that cultural change,” recommends Woolmer. After many years of gradual decrease, sickness absence rates were unchanged in 2011 at 2.2%, against 3% in 2007. The percentage of employees reporting no sickness absence had increased to 51% (from 46% in 2010), an all-time high. Some 13% of companies were also now setting themselves “stretch” sickness absence targets of below 2%, with 70% achieving their target. Nearly 75% of firms report having more than 40% of their employees with zero absence, up from 58% of firms in 2010. Employers that said they did not have any barriers to rehabilitation had, on average, 1.6 days fewer sickness absence per employee than those who identified barriers. This equated to more than four million lost days across UK manufacturing as a whole. The report argued this showed it was important for the Government to recognise the tax treatment of costs incurred by employers for rehabilitation and workplace interventions as well as potential problems caused by NHS capacity issues. Almost 30% of employers polled said that they found the new fit note system more helpful than the previous sick note system, with 11% finding it less helpful and 58% not seeing any difference. The EEF argued that this indicated that it may take many years to achieve “cultural” change and it may not fully become clear how effective the new note has been for another five or more years. Whether or not this is connected with the finding above is a moot point, but more than half (55%) of all respondents expressed some concern about presenteeism. Yet, unlike sickness absence, only 5% said that they monitored or measured lost productivity or the economic cost because of it.